In the Italian medieval and Renaissance periods episodes of sacred history and dogma were often depicted in fresco on expanses of wall, instead of on windows of stained glass, the preferred medium for large works of art in northern Europe. Fresco was carried out by applying a thin coat of wet plaster to a section of the wall and executing the design progressively on each newly surfaced area. Rich earth tones of color penetrated the surface of the wet plaster and bonded with the wall. 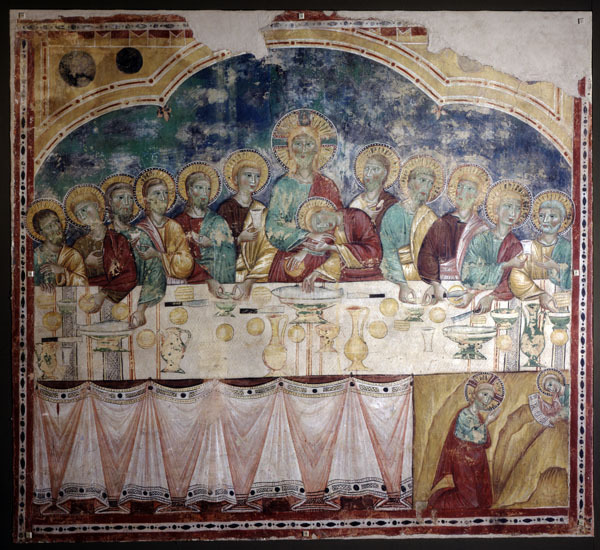 In this fresco from the Church of Santa Monica inter Angelos near Spoleto, two different episodes of Christ's life, The Last Supper and The Agony in the Garden, are combined within a single frame, a juxtaposition typical of medieval concepts of narrative. These subjects were popular choices for the walls of monastic refectories (dining halls) as well as churches. Also typical of its time is the spatial rendering, which seems inconsistent and awkward to the modern viewer: the tabletop is seen at an angle, but the dishes are depicted in profile view. The apostles surrounding Christ, who sits at the apex of their triangular configuration, are gathered improbably on one side of the table. The decorative folds of the tablecloth, the jeweled halos, and even the linear highlights of the garments emphasize decorative patterning of the surface rather than the illusionistic space and three-dimensional form that were to become artistic features of the centuries following.